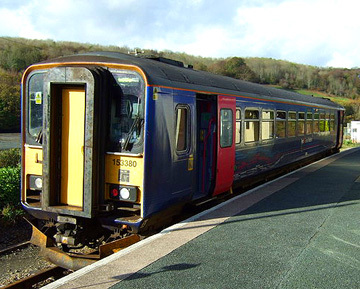 The Class 153 Super Sprinter is a single car diesel multiple unit (D.M.U.) converted from British Rail Class 155 units. These units were originally built as two-car Class 155 units by British Leyland from 1987–88, but were converted by Hunslet-Barclay at Kilmarnock from 1991–92. Their maximum speed is 75 mph (121 km/h) and they are used by various rail franchises on mainly local routes.